Molly Mabray is a 10-year-old Athabascan girl who lives in the fictional village of Qyah in Interior Alaska. This summer, kids across the country will be able to watch Molly, her dog Suki and her friends on their various adventures around the state in "Molly of Denali," the first nationally distributed kids program to feature a main character who is Alaska Native. In building the show, producers at PBS and Boston public media station WGBH reached out to Alaska Native groups around the state to form partnerships, and ensure both authenticity and respect to the subject matter. It’s through these partnerships that Dewey Hoffman, a Koyukon Athabascan community advocate, became one of the show’s cultural advisers. Hoffman says through Molly’s travels and interactions — Molly’s mother is a pilot and she helps her parents run their local store — the show highlights many aspects of Native life in Alaska. He says the creators are trying to feature five Alaska Native words or phrases in each episode with enough context for Outside viewers. There will even be an episode where Molly gets a traditional Athabascan name. Hoffman says there will also be traditional rural activities such as subsisting, dog mushing and canoeing. Even though "Molly of Denali" is a kids show, Hoffman says that the cartoon tackles some heavier issues, such as inter-generational trauma among Native people. For several generations, many Native people were sent off to boarding schools where their Native cultures were suppressed. Hoffman describes the plot of one of the episodes. Recently, PBS and WGBH announced six Native screenwriting fellows who will be working on the show, bringing their Indigenous perspectives and stories into the picture. Haida filmmaker Joe Yates is one of the fellows. Yates says that the episode he’s working on deals with sports in Native communities. He says the fellows come from a wide range of Native backgrounds, and he’s grateful for the opportunity to help tell the story of Alaska Native people to a wider audience. In preparation for the launch, the producers have held several test screenings in the state. Hoffman’s happy the show has received positive responses from Native children and their families. He says there aren’t a lot of portrayals of Native people in mainstream television, especially kids programming. “It’s really important to understand that if they’re portrayed in a positive or negative light, that actually has an impact on their self esteem and how they view themselves,” Hoffman said. For non-Native viewers, Hoffman hopes the show will portray a more nuanced view of life in Alaska beyond the typical outdoorsy tourist stuff like fishing, nature and wildlife. 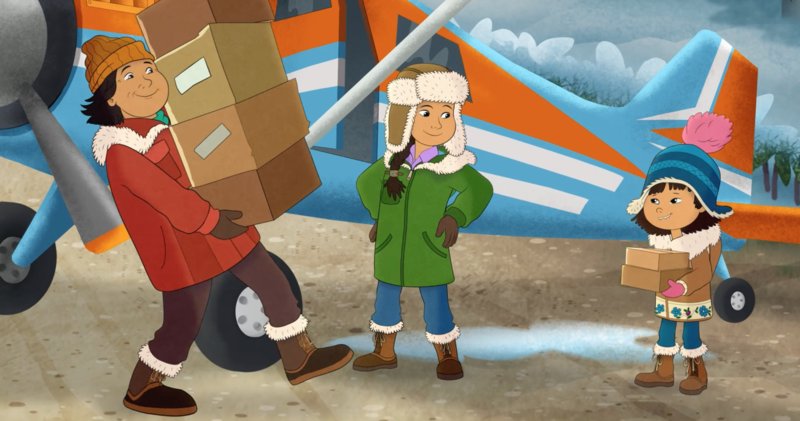 Families across the country will be formally introduced to Molly this summer when "Molly of Denali" premieres on PBS Kids.